How many years have we heard the stories of Ashura, in Arabic, Persian, Urdu, and English? How many tears have we shed tears for the tragedy that befell the grandson of the Last Messenger of Allah (s)? For how long have we been told of the stories of Ali Al-Asghar, son of Imam Hussain (as), who was brutally martyred by the arrow of the damned Harmalla. All the time we were told the stories, in our mind we would imagine the scene, the heat of the desert of Karbala, the dryness of the family of Prophet Mohammad’s (s) mouth. We imagined how Imam Hussain (as) would raise his younger child, who was only months old, to the sky. And he would ask the opposing army of Yazid son of Muawyah the cursed; “if you are against me, what has this child done for you to be against him”? Truly what kind of a person can you be to deprive an infant child of the most basic of human rights, water! When you stand by the canal which is diverted from the Euphrates, and you look deep enough into that water, you see the face of Abulfazl Abbas (as). You see the beauty of his bravery, the light of his loyalty to his brother and the Imam of his time, Hussain (as). Cut off from water for three days, no mercy being shown to the grandchildren of Messenger of Allah (s), Abbas (as) was the last of the companions of Imam Hussain (as) on the day of Ashura. He had managed to cut through the army of Umar son of Saad and reached the Euphrates. – We take water for granted, but if it is cut off from us for a day, or even half a day, we lament for our fate. Imagine yourself to be the beloved grandchild of a Prophet. The person whom the same Prophet titled, the leader of the Youth of Paradise. A title shared only by your brother. Now imagine an army, numbering in tens of thousands standing against you, so full of hatred that they want to kill you and your children. What would amaze you is that army professes to be the follower of your grandfather, the same Prophet who brought them out of an era of darkness and inhumanity. And yet they wish to kill you and your family, only because you do not pledge allegiance to their evil leader. A man so deprived of humanity he would fireball the Kabbah and attack the mosque of the Holy Prophet, same holy prophet he claims to succeed in leadership. 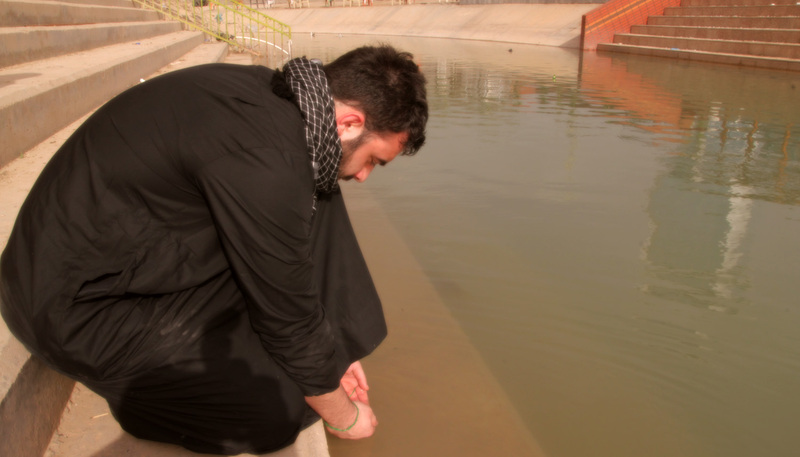 AbuFazl Al-Abbas (as) kneeled in front of the water, so sweet and tempting to any who has been thirsty for three days. He put his beloved hands into this water, the coolness reminding him of the paradise awaiting him. Raised the water towards his face, only to prove to the world that Abbas (as) is not only the brother of Hussain (as), but the most loyal of his companions. Not drinking the water he threw it back to where it came from. We stood in front of the Euphrates, and imagined all this and more. Stories that have been recited to us for decades of our lives every year in the holy month of Muharam. 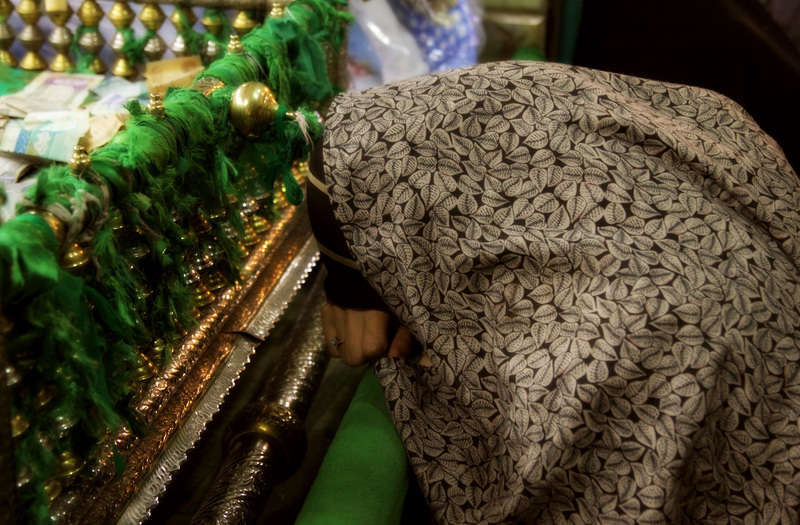 But to be in the same space that was shared by the great Abbas (as), you cannot but feel pain, and sorrow. Your eyes filled with tears, of not only the pain and suffering inflicted, but by the strength and pride you feel in Abbas (as), son of Umul Baneen, Mother of the Children, and son of the Commander of the Faithful himself, Imam Ali (as). This was the beginning of our journey on this day of days. We moved to locations that marked the place where Abbas (as) was attacked once he managed to fill his water pouch with water for the children of Hussain (as). But they, the army of darkness and evil, were determined not to let the standard bearer of the tribe of Hashim to get through. They attacked from all directions, striking at his arms and cutting them off. When we arrived at these holy locations marking where the arms of Abulfazl Abbas (as) were severed, you realised where you were. All this time visiting the shrine of Abbas (as) across the street, you knew he was great, you knew he was the symbol of bravery and loyalty. But for a split second standing at those locations, you realised the reality of what Ashura is, and who Abbas (as) is. Ashura is where pure evil came in direct conflict with pure good, not like a film, but for real. This event for a moment felt so real that the magnanimity of it makes your mind spin. It’s as if all your life you are told what electricity is, but for one moment you actually feel the power of electricity go through your body, the shock and power of it, numbs you. This is the closest I can explain realising who Abbas (as) brother of Imam Hussain (as) is, for that split second. “If I had a thousand sons, I would name them all Ali”! This is how much Imam Hussain (as) loved his father, that he would name all his sons after him. We all love our fathers, for the kindness they show us, for when we fall they pick us up, for when we make mistakes they are there to help us amend them. But imagine your father is the first man to profess to the religion of Islam, imagine for a second that your father is the only person to be born in the holiest of houses, the Kabbah. Imagine for a second if your father was closest to the most pure of Allah’s creation. Imagine if your father was named the sword of Allah and the gate to Allah’s knowledge given to his Last Messenger (as). Imagine if your father is Ali son of Abitalib (as), would you also name every child that you had Ali? Imagine your son, Ali Al-Akbar, is so close in his features to the Last Messenger of Allah (s), and when you look into his face you see his great grandfather the Seal of Prophethood (s), now imagine how you would feel to see him cut to shreds by the army of Yazid? How would you feel when he tells you, “father, my mouth is dry, I am thirsty”! How would you feel when the final blow is struck and he falls to the ground? 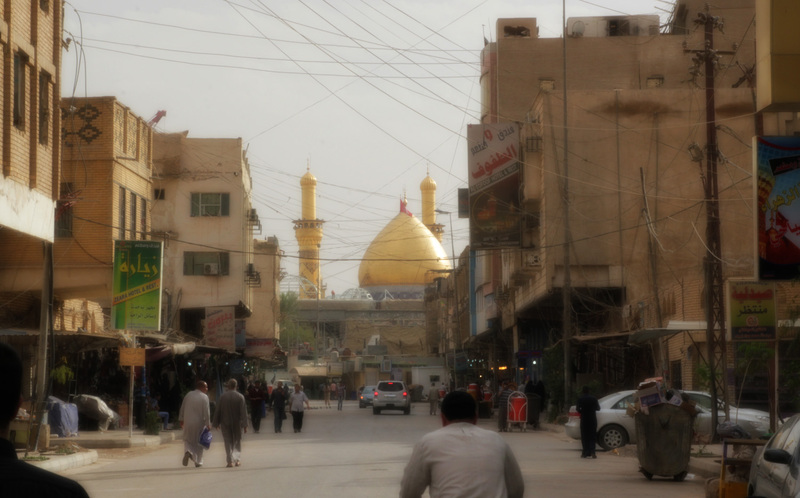 O’ Hussain, I can’t imagine your pain, but I can say, the pain you felt, makes me love you more. The pain you felt was for your Creator, because with your blood and the blood of your children and companions you saved the religion of Islam. So I cannot possibly imagine what the third Imam went through, but I know that by visiting the locations of these incidents, the love I felt multiplied to such extent that I know nothing but Hussain. Of all the stories of Ashura, the most painful and touching is the event of Ali Al-Asghar. An infant so pure, he became a martyr without being able to hold a sword; he saved the religion of Islam without even crying one word or taking one step. The tragedy of Ali Al-Asghar is so painful; many scholars find it hard to write about. Tears falling on the ink that is written on the paper and pain too strong that it defies reason. The inhumanity is brought to life, when you visit the narrow street, marking the location of his martyrdom. A cradle reminding you of the place and age. This is most painful for mothers, who have either had children or those who can’t have children. The innocence of Ali Al-Asghar is so great that non-Muslims remember him on the day of Ashura around the world. His status so high, that he is one of the gates of acceptance of wishes. Allah Almighty loves this infant so much, to the extent that prayers interceded by this beloved grandson of Imam Ali (as) will be answered. To stand at the location where the arrow pierced the beloved throat of this infant was too much for some of our group members to bear. The reality and vividness felt of where we stood, and in the presence of such personalities, humbled us, so much that we couldn’t but express our feeling through tears, and the crying of a beloved for his loved one. The story of Ashura came to life; so much so, it was more powerful than decades of hearing it from the pulpit. We cannot say we lived the story, for only They lived Their story, but we felt a drop of the truth from the ocean of the story Ashura, and we could not with stand that drop of truth, because the pain is so great. Now, I have come to the reality of why, at the end of every mourning for every Imam, or every person who passes away, we mourn the tragedy of Ashura. Without mourning the tragedy of Ashura we are not complete, and our love for Prophet Mohammad (s) does not reach the height of the heavens.